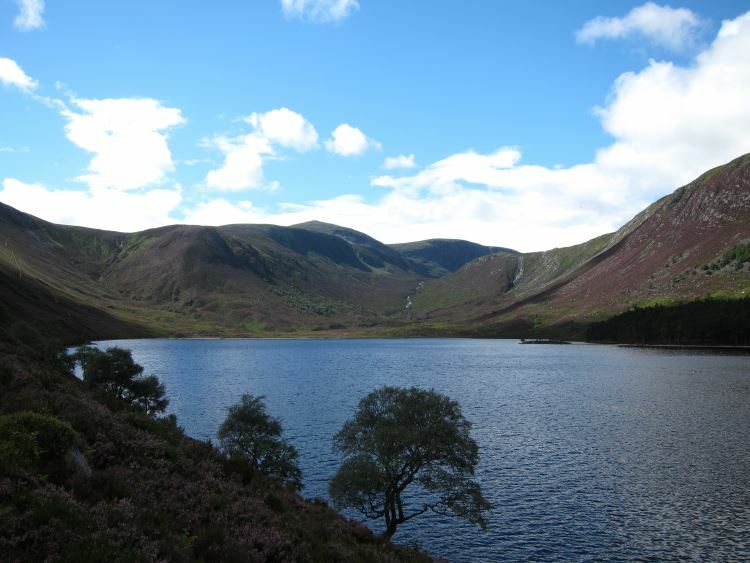 Climb from magnificent, glacial Loch Muick to a horseshoe of forbidding crags around a bleak high tarn. 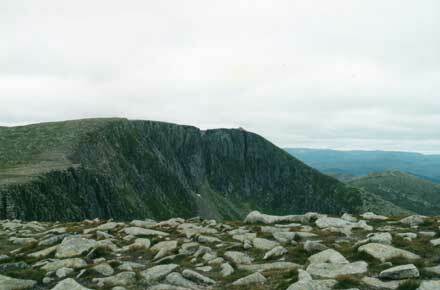 The high Lochnagar ridge has superb views of the Cairngorms and the moorlands of the Balmoral estate. 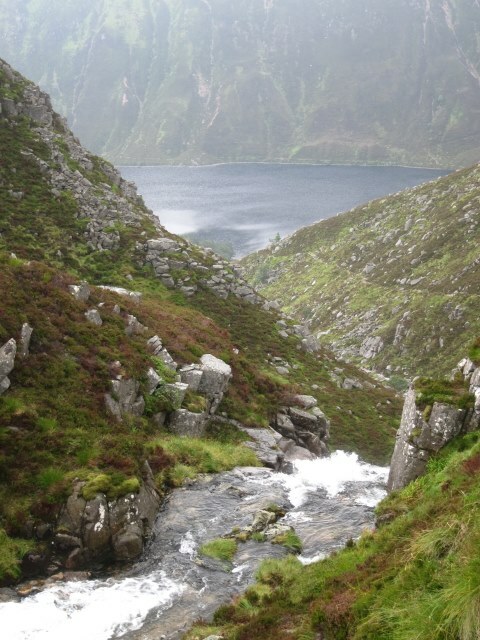 A steep track drops, beside beautiful waterfalls, back down to the shore of Lock Muick. 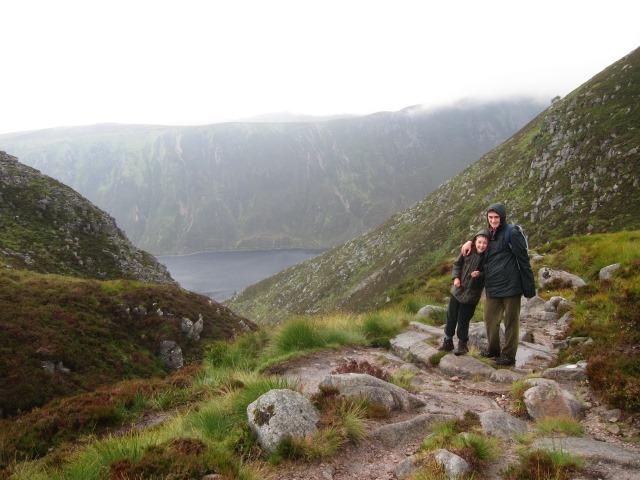 There is also a number of fabulous walks in the Loch Muick area, including a circuit of the lake and trails up onto the high plateaux around it. Lochnagar is a bit schizophrenic. At times, it is sinister and gloomy, a dour and capricious old grandee with its dark (thousand foot) cliffs hunched around the lonely eponymous loch at its base and the bleak, monochrome moorland rolling away to its south. Then the sun emerges and the same moorland becomes a delicate patchwork of bright greens and browns, the ridges now receding into delicate distant blues. But it always dominates mid Deeside, always present even if frequently hidden in low cloud. It is the highest point for miles around, with huge views in all directions. The area is now a wildlife reserve, home to eagles, ptarmigan, otters, mountain hares and red squirrels, as well as a permanently too-large population of red deer which, reserve or not, still have to be culled each year. 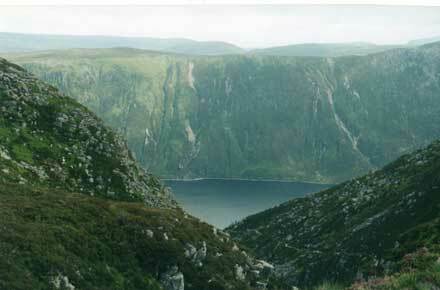 In a deep, narrow glen to the south lies Loch Muick, a textbook example of the effects of glaciation and as moody and unpredictable as its great neighbour to the north. The whole area is lovingly maintained by the Balmoral Estate. 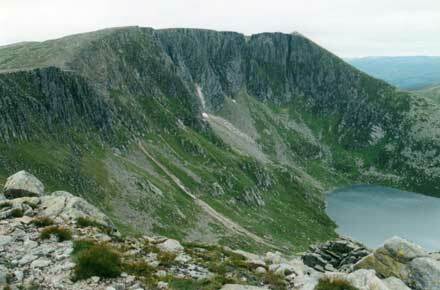 Lochnagar has a selection of superb climbs. From Glen Muick: Lochnager is usually approached from Glen Muick to the south-east. The walk begins by crossing the wide, boggy valley bottom, a lung-opening 20 minute tramp between peaty pools, banks of heather and bogs of impossibly bright green moss. It then climbs through a pleasing stand of large old Scotch pines, with sunny, grassy glades between patches of crunchy pine needles, before emerging onto the bare hillside and starting the real climb. The path climbs steadily through beautiful country beside a little burn for an hour or so. Gradually, the moorland across Glen Muick, and the ridges beyond, come into view. 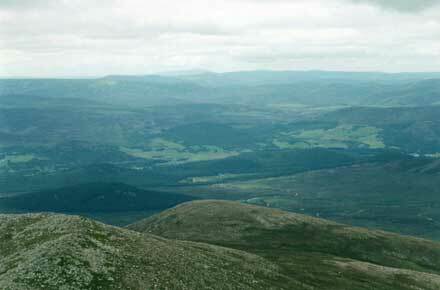 At a high pass, you get the first big views north across the Dee Valley to the high Cairngorms. Turning left, you wind slowly up a long field of broken granite boulders to a high, bare saddle between the summit ridge and the Meikle Pap. This is a favourite lunch spot, with a fine view down into the cauldron, where the peak-base loch sulks, dour and grey, beneath the tremendous cliffs of the curving summit ridge. Then comes the hard bit, although it really isn’t too bad; 20 minutes of mildly unpleasant scramble (eased by the planting of steps in recent years) up a steep slope of granite boulders to a cairn on the broken summit plateau. The track follows the rim of the great chasm round to the west, dipping and winding up round the back and onto the bare rock of the final ridge, to the final tor of vast weather-broken boulders at the western end. Nestle into sheltered crevices and admire the huge views. Then it is the long tramp home. You can retrace your steps, or head almost due south to Loch Muick, then walk out along its shore, a longer route, but unforgettably beautiful. 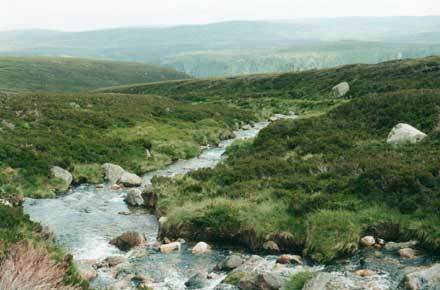 The path descends over heather moor, which slowly folds into the upper waters of the Glas-Altt burn. 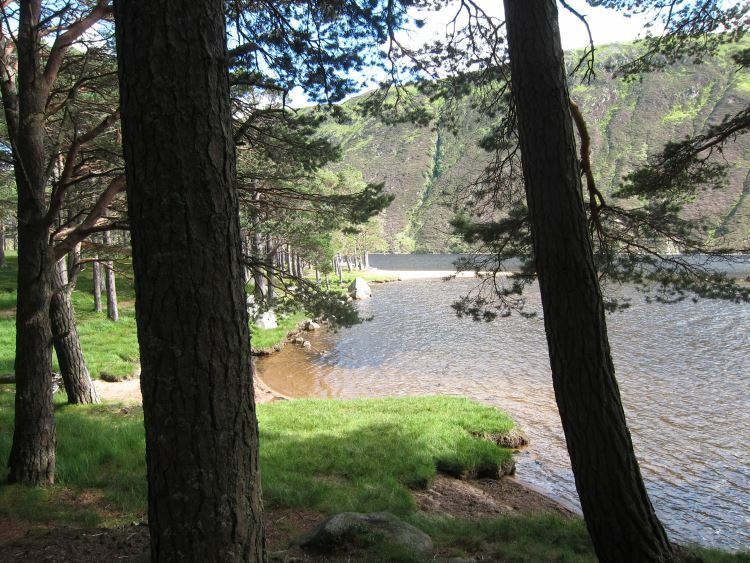 Scramble down beside a spectacular waterfall through great banks of imperial purple heather, gratefully reaching the lakeside and level ground in a stand of fine mature Scotch pines that shelter a lodge, snug on a golden little beach by the lakeside. Turn left along a well-maintained track, and trudge out along the lakeside. From Glen Callater: A magnificent approach is the 14km (6hr) route up Glen Callater to the eponymous lake, turning north to climb onto the high ground, then traversing across to Carn an t-Sagairt Mor with its WWII plane-wreck and on to Carn a’Choire Bhoibheach above its dramatic pair of corries, and on across the high plateau to the Lochnagar summit. 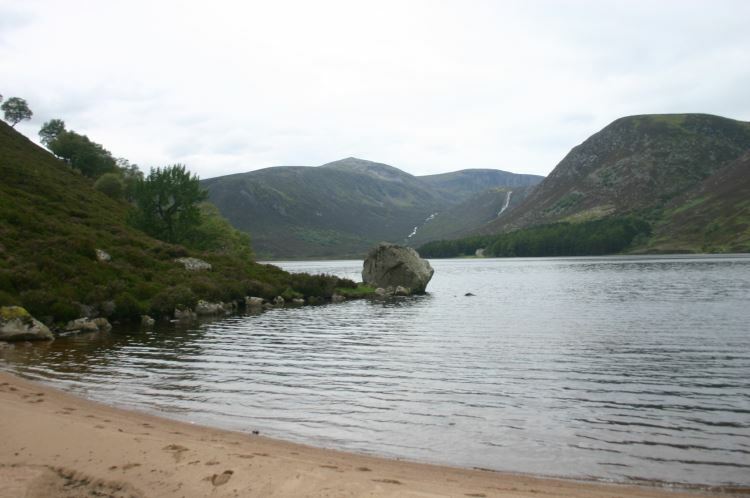 Walkopedia longs to walk a Glen Callater – Glen Muick traverse of Lochnagar, some 22km/9.5hrs of endless visual and natural variety and wonder. Other superb ascents are the pony track from Invercauld Bridge on the Dee (Queen Victoria’s route) via Carn a’Choire Bhoibheach, and the path from Invercauld Bridge taken by Lord Byron for a scramble up the spur between Carn a’Choire Bhoibheach’s two corries, and on across the plateau to Lochnagar. 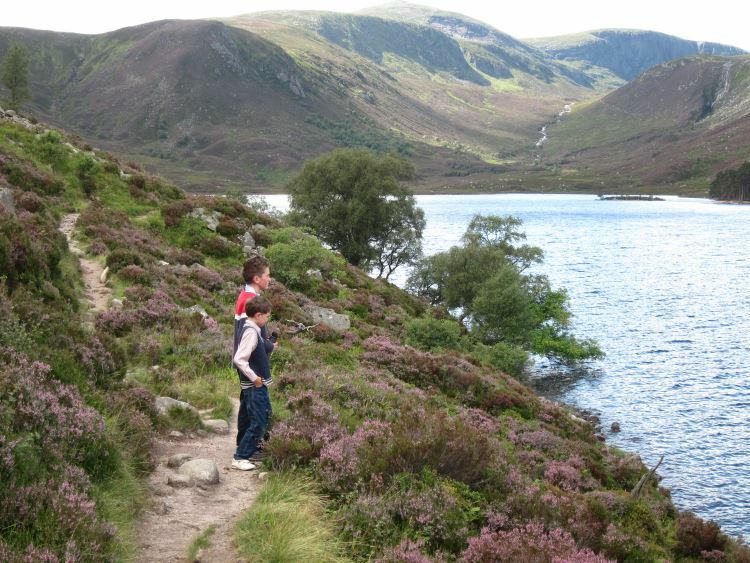 From Balmoral, you can take a good if (relatively) slightly dull track to the high pass where the main climb from Glen Muick branches off, or up a more exciting path via Gelder Shiel to Meall Coire na Saobhaidhe and on up a steep climb to the Lochnagar summit. 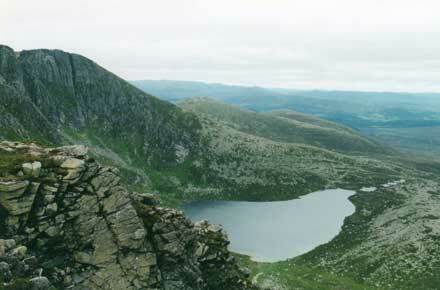 Finally, from the Meikle Pap saddle, you can drop to Lochnagar loch and swing round it on rough ground to climb the steep northern slopes beyond the corrie-precipices. 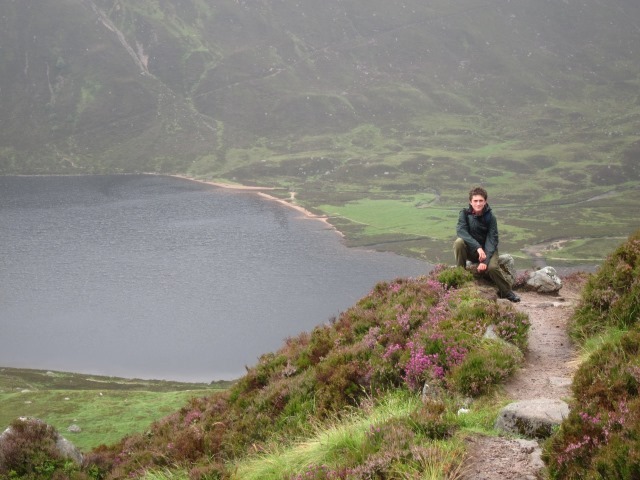 Loch Muick is an exceptional place, an often pewter, then sparklingly purple-and-blue reflecting, sheet between the dramatically steep hillsides of a classic glacial gouge. The heather can seem particularly bright here, and the lakeside is dotted with birch and rowans. 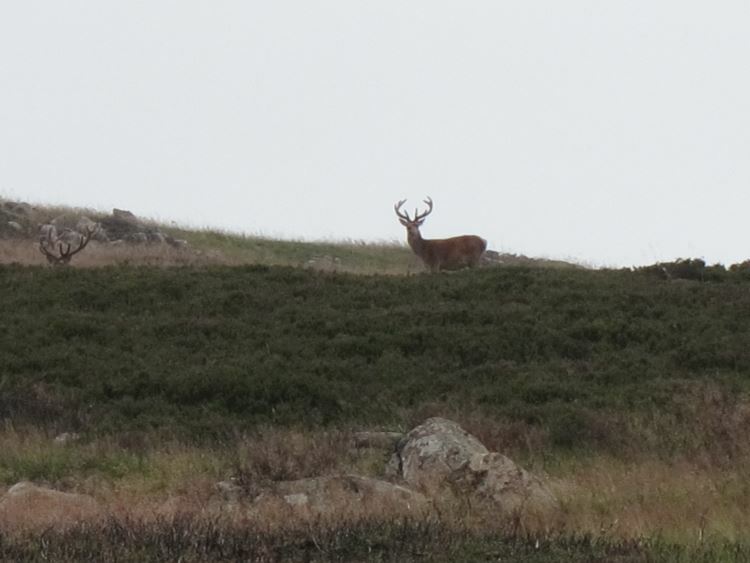 You will be unlucky not to see a large group of deer, and we have seen golden eagles several times. 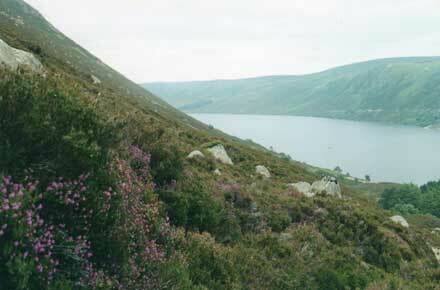 There are numerous excellent walks around Loch Muick, including a 10 mile circuit of the lake, which can be extended by trails up from the lake to higher tarns (the upper Dubh Loch under dark crags in particular) and tracks onto the high hills to the south-west, including the Capel Mounth track to Glen Clova. 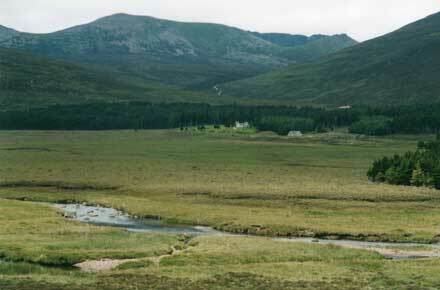 The wide glen below the lake, with its river winding through bright boggy grassland, is also very lovely. 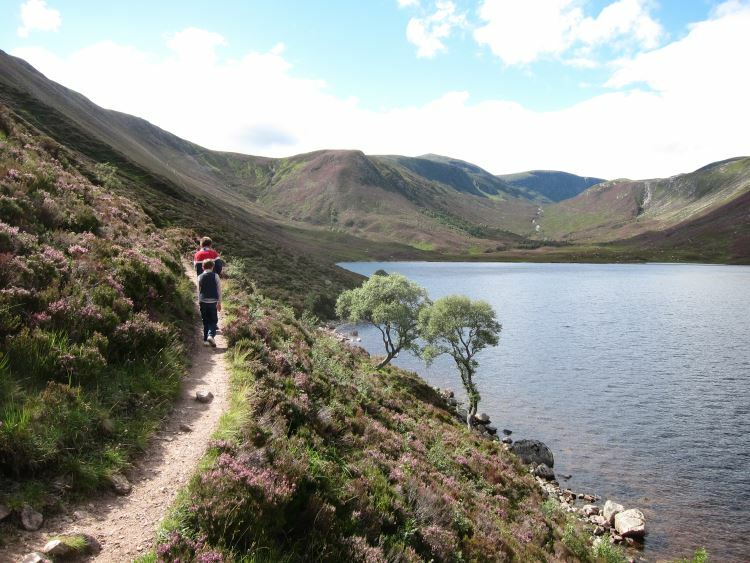 An excellent mid-flank Lochnagar walk is to take the Lochnagar trail from Glen Muick, then to turn hard left at the pass to Deeside and traverse south-west across high moorland before dropping down to Loch Muick by the Glass-Altt turn (see above for more). 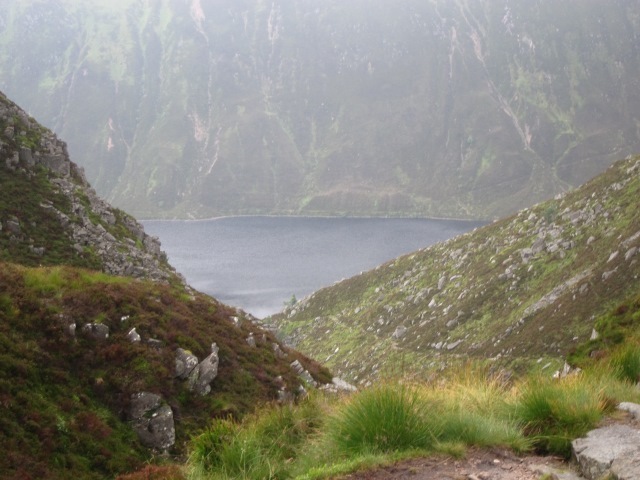 Dubh Loch and Broad Cairn Ridge Circuit; a long (27km) but brilliant route runs round the north side of Loch Muick, then climbs the valley above the head of Loch Muick to the dark, sometimes sinister Dubh (black) Loch, which is surrounded by huge and dramatic cliffs. 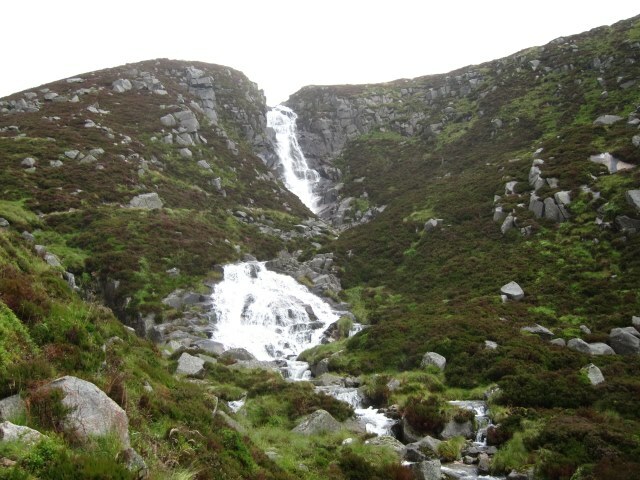 You then proceed up a rough and steep path past a lengthy cascade to a wet upper valley, swinging left to reach the high plateau, to summit the Munro of Carn an t-Sigairt Mor. 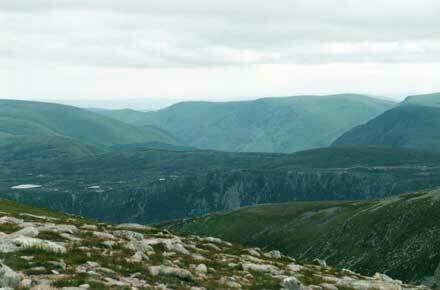 You then carry on along a ridge which takes in Cairn Bannock and Broad Cairn (a 3 Munro day!) before dropping down a beautiful path with views down the length of Loch Muick to the Lakeside path, and return to the lake-foot carpark. There is an exciting short-cut clamber up a gully in the middle of the cliffs south of the Dubh Loch to join the longer circuit at Cairn Bannock. This can be tough mountain walking with uncertain weather. Come prepared. 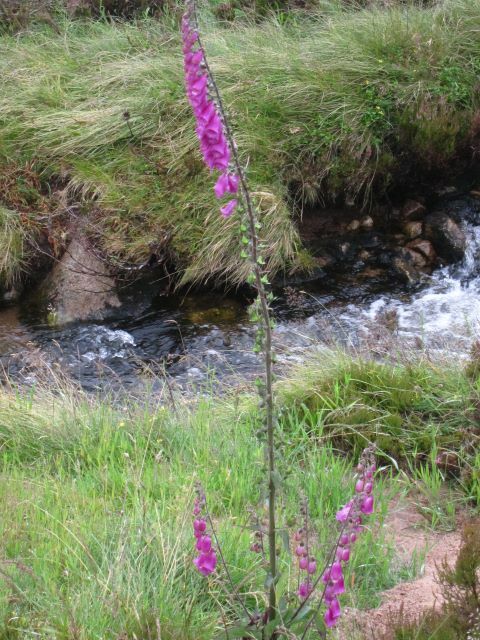 For further general and practical information see our Cairngorms page. The grey precipices of Lochnagar loom high above the river Dee as it winds, dark and peaty, out of its highland glen into gentler territory. It is the highest point for miles around, with huge views in all directions, as far as the sea some 30 miles to the south-east and Ben Nevis some 65 miles to the south-west. 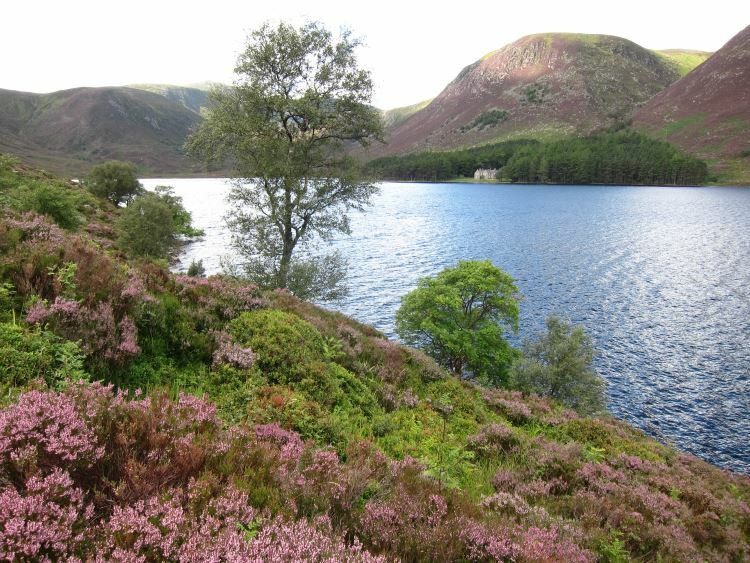 Nearer at hand, the wild moors and rocky peaks of the high Cairngorms dominate the northwestern skyline.